It has been predicted that by 2035 40% of the country’s generation is projected to be gas fired. 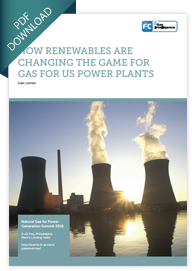 Check out this brand new exclusive whitepaper to get a better understanding of what’s going on in the market and how gas-fired generation helps bridge the gap in the renewable energy mix for the States. If you have any questions do not hesitate to ask me.